Every time I update I apologise for taking so long to update and promise to update sooner next time around. And every time, dear reader, I let you down. My bad. But here goes. Those herculean human Pepperamis, with ants in their pants and a fearsome, irresistible punk-rock fidget propelling their bones, At The Drive In are back, with their first album in 17 years – a slab of super-compelling agit-rock pell mell that has no business being as good as it is. 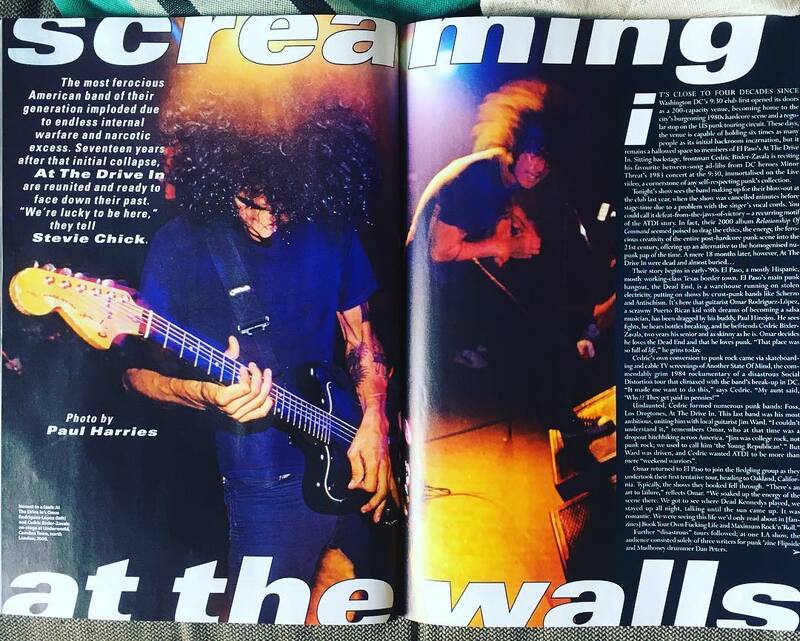 I get deep into the maw of their gnarly formation, their ecstatic rise and their tragic demise – along with their life-affirming reunion – in the pages of the current MOJO. You should buy it, because MOJO is what great magazines look like. Also, they have The Beatles on the cover, whose music I’ve never heard but am informed is really rather good. I also focus on the making of their infernally thrilling new album in*ter a*li*a (the title of which is enough to give career subs fatal conniptions, but so be it) in the latest edition of Kerrang!. It’s a weekly, though, so don’t dawdle, nab a copy now. It’s not all thrashy be-afroed punk-rock around here, though. I also reviewed a slew of stellar funk for the Guardian (though The Internet turned out to be sizeably less-stellar in the flesh than on vinyl). Thundercat was the finest of a killer bunch – seriously, his latest album Drunk is a masterpiece, and the future-jazz contortions he pulls his tunes into onstage have to be heard to be believed – but Anderson .Paak put on a hell of a show, too. Most recently, in the company of wonderful regulars Andrew Harrison and Matt Hall and fellow newcomer Rebecca Nicholson, I rambled about Paul Weller, Jane Weaver, House music and, ever so briefly, my beloved Feral Ohms, for the Bigmouth podcast. Give it a listen. It’s very big among dog-walkers, apparently, but really there’s no canine required. And that’s all she wrote. Give it six months or so, and I’ll manage another update, I reckon. No promises, though. This entry was posted in Uncategorized and tagged Anderson .Paak, At The Drive In, Bigmouth, Feral Ohms, Jane Weaver, Paul Weller, The Internet, Thundercat. Bookmark the permalink.